MSN team released a new beta version of Windows Live Webmessenger. Windows Live Webmessenger is the official web based version of Windows Live Messenger. 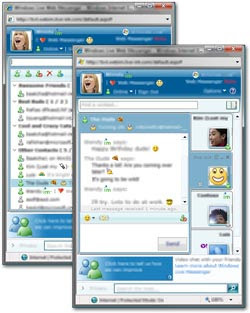 It allows you chat with your MSN buddies on your browser withour downloading any chat client. # Easily change your display name or personal message. # Have lots of different conversations at the same time. # Your Messenger contacts are already loaded. # You can also connect with your Yahoo! IM contacts.